Have you ever tried guava juice? This tropical fruit is not only delicious, but also great for your health. Learn more about guava juice benefits in this article! Guava is one of the most nutrient rich fruits that nature has to offer. It has amazing benefits for the body, filled with phosphorus, niacin, potassium, vitamins A and B, iron, calcium, and folic acid. There are too many good things about guava juice to describe here. Guava is a tropical fruit that has more than 100 different varieties, including yellow, red, and white. Although it’s usually eaten as a whole fruit, today we want to tell you about the guava juice benefits. Believe it or not, guava juice helps alleviate pain caused by certain conditions like stomatitis and inflammation of the gums. Just remember to brush your teeth thoroughly after you drink it, because it contains natural sugars that could accelerate tooth decay. There are two extreme intestinal conditions that guava juice can resolve: diarrhea and constipation. 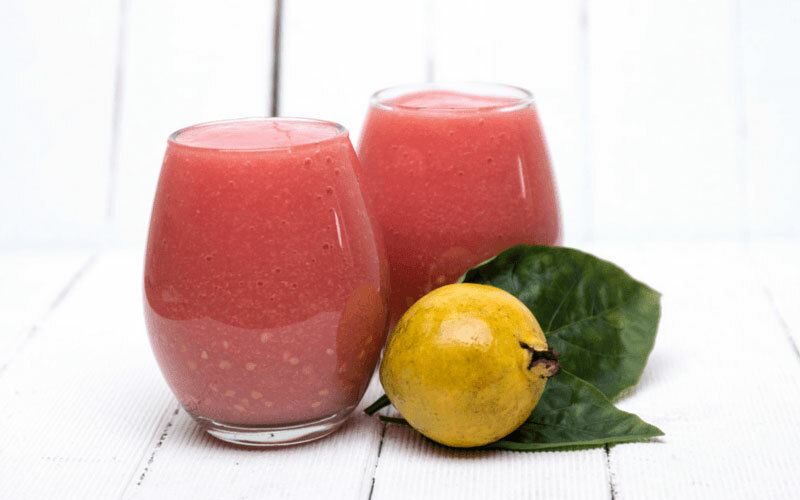 Thanks to its excellent contribution of fiber, a small glass of guava juice manages to activate and stabilize the function of your digestive system. Regular consumption of guava juice helps you lose weight quickly and effectively. Because guava contains dietary fiber, it helps in the removal of toxins and fats. At the same time, it provides large amounts of energy to your cells. Guava juice benefits are excellent for keeping your blood sugar levels in good condition. This is because this juice actually increases insulin production. It’s important to remove the skin from the fruit first, preparing the juice using some of the leaves from the plant itself but without any processed sugar. You should also ensure that you don’t exceed the daily recommended amounts because while it does help control glucose, it also supplies the body with sugar. Guava contains a large amount of lycopene. This is a powerful antioxidant that fights the free radicals in the body and decreases the chances of activating cancer cells. Consuming guava juice helps control disease epidemics that often occur during the winter or rainy season, like colds and the flu. This is because its high vitamin C content naturally strengthens your immune system. Guava juice contains large quantities of vitamins A, E, B, and potassium. This provides you with antioxidants that protect the skin and keep it looking healthy, fresh, blemish-free, and toned. Drinking it on a regular basis will help you maintain a youthful appearance and prevent premature aging. Thanks to its iron content, guava juice is ideal for fighting anemia. Drink this juice if you feel very weak or have been diagnosed with anemia. All of this helps prevent heart disease. Guava strengthens the immune system when you prepare it as a juice. It increases your white blood cell count and favors the production of enzymes that repair your cells. We could spend all day talking about the benefits of adding guava juice to your diet. Remember, however, that nothing should be consumed in excess, so here are some tips for drinking guava juice correctly. Don’t buy canned or bottled guava juice. The additives and preservatives negate its medicinal properties. Avoid adding refined sugars when you make this juice at home. When you do, you reduce the health benefits for your body. Don’t mix in too many other fruits. Ideally, drink pure guava juice. When you add other fruits, it increases the amount of sugar and poses a risk to your glucose levels. As you’ve seen, guava juice is a great option. Add it to your daily diet while taking the above recommendations into account. Guava is indeed a super fruit and your post explains it really well.